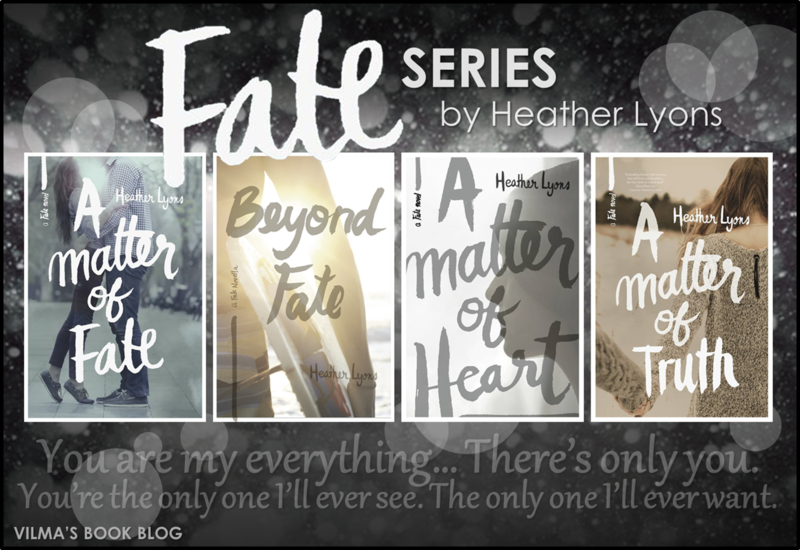 Day 4 of Paranormal Week spotlights the Fate series by Heather Lyons. Some of my friends kept insisting I give these a try and one day, I decided to ignore my reading schedule and I squeezed in book 1, A Matter of Fate. I fell in love! I was so pulled in my the story, the heartbreak and dare I say it… the love triangle! This series technically is a paranormal/fantasy book, but the supernatural element is almost secondary to the story, which at its heart is about finding love and the strength within. This is the synopsis of book 1, A Matter of Fate. One of the reasons I love these books so much is that they are so heartfelt. The story is sort of inherently heartbreaking and you really feel the impact of those emotions as the characters move through the story. Chloe’s journey is one of heartbreak and sadness–of being emotionally torn. Throughout the series, she also does a lot of growing up, learning who she really is and finding her own inner strength. The cast of supporting characters is also comprised of really interesting people and together, along with the Whitecomb twins and the gripping nature of the story, you can’t help but fall in love with this story and its characters. This is an emotional, imaginative, well-written series that will hook you from the very beginning with its beautiful, complex characters and their heartrending story. Absolutely love this series! First off, I want to admit I really love Contemporary Romances and read a lot of them. But the thing is—when it comes to fiction (at least for me), I value variety. So for anyone to claim that paranormal books are passé is really surprising to me, as I’d be bored to tears reading only one genre over and over again. Personally, I love writing Paranormal/Fantasy stories. I love the whole idea of the fantastical, and of how it stretches my imagination to places I never dared to conceptualize before. One of the reasons I, along with others, immerse ourselves in these kinds of stories is because it allows us experiences we can only ever dream of as they lie outside our realities. Recognizing yourself in a contemporary story is great—visualizing yourself in the fantastical is magical and a gift. Tell us about the Fate series! Remember all those Greek and Roman legends you learned as a kid, where there were gods and goddesses who controlled most aspects of life, from the weather to food production to knowledge? Now, imagine they were real—and not with gods and goddesses, but a secret race of beings who influence the course of events on seven different planes of existences. In my series, these entities are called Magicals; one of the most powerful ones of these god-like people, a Creator, happens to be a confused seventeen-year-old girl named Chloe Lilywhite. To add to the chaos and responsibilities in her life, she becomes entangled in a pretty complex and messy love triangle with twin brothers—one of whom she’s dreamed about since early childhood. will be released on November 5th! What can you tell us about it? Anything you can share??? I think the title of this book is a really good indicator of what this installment in the series is—it’s all about Chloe discovering her truths. Who is she? Who does she want to be? What does she want out of life? What does she need? What is she willing to sacrifice to achieve these things? It’s all about her deciding whether or not she goes along with the plans that Fate and Magical-kind have in store for her or finding her own way in the worlds. Honestly, I have to admit I love the journey Chloe goes on to get to where she is. Plus, it introduces readers to one of my very favorite characters in the series! What’s next for you after A Matter of Truth? I’m currently working on a romantic comedy that has nothing to do with the Fate universe—one whose characters just won’t leave me alone. Hopefully I can share some details on it soon, because I’m really excited about this one. After that, I’ll be working on both the fourth book in the Fate series (due out in March) and Kellan’s POV of A Matter of Heart. I think it requires a lot of thought ahead of time—and an agreement you make with yourself, as the author, to stay true to your world building and not go nuts and change things just to suit yourself and try to get out of corners you may have found yourself in. I try to remain consistent and will fact check the previous books often to make sure I’m keeping events in line with others that have occurred before. It’s pretty frustrating for me, as a reader, when I read books that are constantly shifting—so I want readers to feel like they know the Fate universe and trust that it’s going to be a familiar place for them when they enter each book. 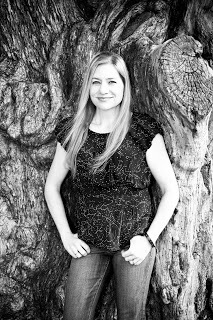 My release schedule is based a lot on my writing schedule—I’m a stay-at-home mom with three kids 7 and under, so while I’m in utter awe of other authors who are able to crank out their series books so quickly, I’ve usually got a good five months in between my releases simply because I don’t have the time to write them any faster. I keep telling myself that those five months are still a heck of a lot faster than the typical year in the traditional publishing world. As for readers needing to reread . . . hmm. I’m the sort of book lover who does that sort of thing myself, because when I immerse myself into a series, I like to make sure there’s a smooth transition from one installment to the other. That said, I’ve tried to make the books easy to pick up and jump right back into Chloe’s journey. A paranormal series that I just adore to pieces is The Demon’s Lexicon trilogy by Sarah Rees Brennan. These books, utterly witty, gritty, and heartbreaking all at the same time, have gorgeous, lyrical prose that sends me into writer-envy fits. I also really enjoyed Lament and Ballad by Maggie Stiefvater, because I’m such a sucker for faeries, and these are dark and unapologetic about how they portray such beings. Rachel Hawkins Hex Hall trilogy was hilarious, and Cynthia Hand’s Unearthly series beautiful. As for my very favorite . . . although they are heavily fantasy-based (much like my series), I am in utter love and awe with Kristin Cashore’s Graceling Realm books. In my opinion, the second book in the series, Fire, is a thing of exquisite beauty. Cashore’s writing always inspires me to step up my game tenfold. I adore her consummate world building, but also beautiful sentences and characters that make me want to hold them inside and never let go. Thanks for having me, Vilma! I love your blog so very much! Heather Lyons has always had a thing for words. She’s been writing stories since she was a kid. In addition to writing, she’s also been an archaeologist and a teacher. This is another series that’s on my TBR list! I’m really intrigued by the love triangle between Chloe and the twins! Thanks for the giveaway! I love Heather Lyons and this series is awesome. Thank you for participating in this awesome Halloween giveaway. I want to read the series because I have heard nothing but great things about it so far!! Thank you for the chance! I love to read this series! Great giveaway!! Thank you!! Great giveaway! Thanks for the chance to win some great prizes!